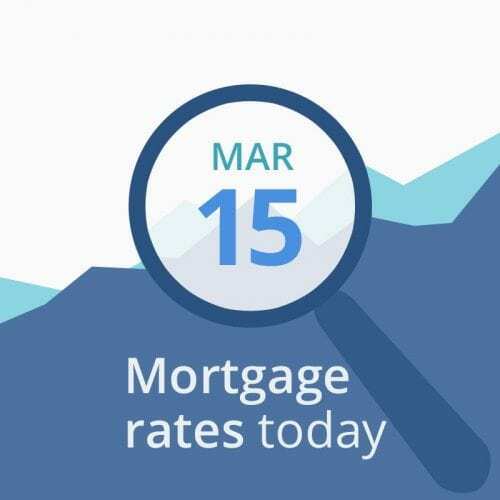 Average mortgage rates were unchanged yesterday. So they remain at their lowest level for 15 months. That was in line with our prediction. But it’s been a frustrating week for rate forecasters. Markets remain essentially becalmed, and that means even a mild breeze (a vote in the British parliament, say) can see them change course. Will they take on a firm direction soon? Perhaps. But we may have to wait until the middle of next week — or even longer. The data below the rate table are indicative of mortgage rates falling today. However, it’s possible an unexpectedly good last-minute report on consumer sentiment could influence that. This morning started well. Let’s hope it stays that way. Too often recently, we’ve seen markets slow, speed or reverse direction during the day. The UK parliament decided yesterday to request an extension to the Mar. 29 deadline on which the country is supposed to leave the European Union (Brexit). That’s good. Except there’s zero agreement on the length that extension should be or on what should happen during the extra time. The nation’s politicians currently seem incapable of finding any consensus for anything. And that means that the economic self-harm resulting from uncertainty continues. If those politicians eventually find a way forward, that would be good news for the global economy and might see mortgage rates rise. If the muddle continues or the country crashes out with no deal (still a possibility), mortgage rates could stay low or even dip further. Meanwhile, markets are increasingly focused on current U.S.-China trade talks. Yesterday, President Trump gave reporters a progress report: “We’ll have news on China. Probably one way or the other, we’re going to know over the next three to four weeks.” His original Mar. 1 deadline for an agreement passed two weeks ago. But both sides badly need a good outcome, and for similar reasons: to shore up political support at home and to step back from economic slowdowns. However, markets worry those pressures will prevent a win-win conclusion — and might even result in no deal being reached or a lose-lose one. Once the talks end, markets will digest the outcome in detail. If no deal is concluded, or if the one that ‘s agreed turns out to be worse than neutral for the U.S., expect mortgage rates to tumble. But, if it’s a win-win — or even just not too terrible and simply brings uncertainty to an end — they could rise. So, on balance, we see grounds for caution. And we’re continuing to suggest that you lock if you’re less than 30 days from closing. Of course, financially conservative borrowers might want to lock soon, whenever they’re due to close. On the other hand, risk takers might prefer to bide their time. Only you can decide on the level of risk with which you’re personally comfortable. If you’re still floating, do remain vigilant right up until you lock. Continue to watch key markets and news cycles closely. In particular, look out for stories that might affect the performance of the American economy. As a very general rule, good news tends to push mortgage rates up, while bad drags them down. By comparison with last week, there are fewer economic reports in coming days. Investors and analysts will certainly have paid attention to today’s industrial production and capital utilization data, both of which are measures of the strength of American industry. Both failed to live up to expectations, with production particularly disappointing. On first hearing the news, investors responded as you’d expect and yields on 10-year Treasury bonds fell sharply. Unless something intervenes to change the mood, mortgage rates could be lower this evening. Given the importance of consumer demand to the economy, consumer sentiment can also sway markets. This morning’s figure was noticeably better than expected. Unfortunately, it was published just as this article was being posted so we can’t assess its impact on markets. But it may blunt some of the downward momentum in mortgage rates. That’s because markets tend to price in analysts’ consensus forecasts (we use those reported by MarketWatch or Bain) in advance of the publication of reports. So it’s usually the difference between the actual reported numbers and the forecast that has the greatest effect. That means even an extreme difference between actuals for the previous reporting period and this one can have little immediate impact, providing that difference is expected and has been factored in ahead. Although there are exceptions, you can usually expect mortgage rates to move downwards on bad news and upwards on good.